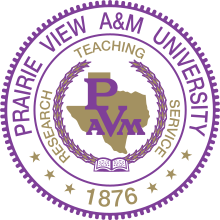 Prairie View A&M University, commonly abbreviated PVAMU or PV, is a public historically black university (HBCU) located in Prairie View, Texas, United States (northwest of Houston). The university is a member of the Texas A&M University System and Thurgood Marshall College Fund. In 2016, PVAMU celebrated its 140th year in existence. Prairie View Produces Productive People. The university offers baccalaureate degrees in 50 academic majors, 37 master's degrees and four doctoral degree programs through eight colleges and the School of Architecture. 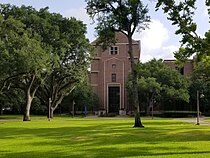 PVAMU is one of Texas's two land-grant universities and the second oldest public institution of higher learning in the state. Prairie View A&M fields 16 intercollegiate sports team, commonly known by their "Prairie View A&M Panthers" nickname. Prairie View A&M competes in National Collegiate Athletic Association (NCAA) Division I and the Southwestern Athletic Conference (SWAC). Prairie View A&M is the only charter member remaining in the conference. The university was established by Article 7 of the Texas Constitution of 1876, created near the end of the Reconstruction Era after the American Civil War. In that year, State Senator Matthew Gaines and State Representative William H. Holland – both former slaves who became leading political figures – crafted legislation for the creation of a state-supported "Agricultural and Mechanical" college. In the article, the constitution stated that "Separate schools shall be provided for the white and colored children, and impartial provisions shall be made for both." The legislation made Prairie A&M the first state supported institution of higher learning for African Americans in Texas. In an effort to comply with these constitutional provisions, the Fifteenth Texas Legislature, consistent with terms of the federal Morrill Land-Grant Colleges Act – which provided public lands for the establishment of colleges – authorized the "Alta Vista Agriculture and Mechanical College for the Benefit of Colored Youth" as part of the Agriculture and Mechanical College of Texas (now Texas A&M University). In 1945, the name of the institution was changed from Prairie View Normal and Industrial College to Prairie View University, and the school was authorized to offer, "as need arises," all courses offered at the University of Texas. 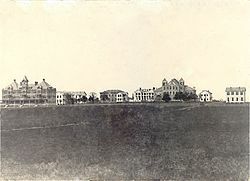 In 1947, the Texas Legislature changed the name to Prairie View A&M College of Texas and provided that "courses be offered in agriculture, the mechanics arts, engineering, and the natural sciences connected therewith, together with any other courses authorized at Prairie View at the time of passage of this act, all of which shall be equivalent to those offered at the Agricultural and Mechanical College of Texas at Bryan." And finally in 1973, the legislature changed the name of the institution to Prairie View Agricultural & Mechanical University (Prairie View A&M University). In 1983, the Texas Legislature proposed a constitutional amendment to restructure the Permanent University Fund (PUF) to include Prairie View A&M University as a beneficiary of its proceeds. The 1983 amendment also dedicated the University to more enhancements as an "institution of the first class" under the governing board of the Texas A&M University System. The constitutional amendment was approved by the voters on November 6, 1984. . In 2000, the Governor of Texas signed the Priority Plan, an agreement with the U.S. Department of Education Office of Civil Rights to establish Prairie View A&M University as an educational asset accessible by all Texans. The Priority Plan mandates creation of many new educational programs and facilities. It also requires removing language from the Institutional Mission Statement which might give the impression of excluding any Texan from attending Prairie View A&M University. In 2004, Prairie View A&M established the Undergraduate Medical Academy (UMA) which is a highly selective and rigorous pre-medical program designed to prepare and mentor academically talented undergraduate students for success in medical school. UMA began as a result of a Texas legislative mandate in 2003 and is state funded with a mission to increase minority representation in the medical field and redress statewide physician and dentist shortages. Additionally, Prairie View A&M established a highly selective honors program for academically exceptional undergraduates who meet the specified GPA, SAT/ACT, and recommendation criteria. Prairie View A&M is consistently recognized as one of the top institutions in the country for producing the highest number of African-American architects and engineers by Diverse Issues in Higher Education. Prairie View A&M annually awards the second most STEM degrees in the Texas A&M University System. Prairie View A&M academic programs are accredited by the Southern Association of Colleges and Schools Commission on Colleges and each college within the university holds additional accreditation or certifications. The John B. Coleman Library is the main library on campus. It is a five-story, 150,000 square foot building completed in 1988. The library provides several services to assist students and is home to over 370,000 Volumes, including over 700 print periodicals, and close to 4,000 media materials. The library is also home to art galleries and a vast collection of historic and special archives. 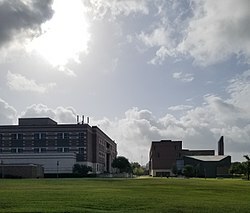 The university has over 50 buildings on its 1,440-acre (5.8 km2) main campus in Prairie View, Texas, and is 48.8 miles (78.5 km) northwest of downtown Houston. The campus is often referred to "The Hill" because it rests on a hill in the region. The campus is also often described as the most beautiful in Texas. The university also has two branch campuses in Houston with the Northwest Houston Center and College of Nursing campus in the Texas Medical Center. The branch campuses offer several degree programs. As of fall 2014 the university enrolled 6,932 undergraduate students, 1,265 students in masters programs, and 146 in doctorate programs. 5,111 (61%) of the undergraduate students were female and 3,232 (39%) were male. Also as of fall 2014, of the 8,343 students enrolled, 6,958 (83%) were African-American, non-Hispanic; 267 (3%) were white, non-Hispanic; 420 (5%) were Hispanic; 234 (3%) were Asian; 33 were Native American or Alaska natives; 6 were Hawaiian; 144 (2%) were multiracial; 237 (3%) were "international;" and the ethnicity of 44 (1%) was unknown or unreported. The percentage of African-Americans slightly dropped from 86% in fall 2010 and the percentage of Hispanic and international students had slightly increased. 7,682 (92%) of the students were from Texas, 456 (5%) were from other states, and 205 (2%) were from other countries. In 1998 ACC was awarded the contract to develop, build, and manage a student housing property at PVAMU. Both student residence housing properties at PVAMU are owned and operated by American Campus Communities. Freshmen students on campus may reside in the University College community. Upperclassmen may live in apartment style living in University Village (phases I, II, III, VI, and VII). The first of these apartment buildings was built in 1995. The University Square, completed in October 2017, is the newest student housing facility on campus with 466 beds available for juniors, seniors, and graduate students. University College opened in 2000. As of the fall of 2001, 40% of on-campus students lived at University College and the remaining 60% lived at University Village. Previous buildings that formerly housed students include Alexander Hall, Banks Hall, Buchanan Hall, Collins Hall, Drew Hall, L. O. Evans Hall, Fuller Hall, Holley Hall, and Suarez Hall. Suarez Hall was already closed in 1996. In 1997 Alexander Hall, Buchanan Hall, and Collins Hall had closed. In 1998 Holley Hall had closed. In 2000 Drew Hall, Evans Hall, and Fuller Hall had closed. During the same year, Alexander, Buchanan, and Holley had been demolished. In 2001 Banks Hall had closed. PVAMU is home to over 150 honorary, professional, special interest, and Greek organizations established on campus. Since 1982, the Student Government Association (SGA) has been the highest ranking student organization on campus and official voice of the student body to the University Administration, as well as all internal and external organizations. Prairie View A&M University offers a wide variety of varsity and intramural sports programs. Men's and women's athletic teams are nicknamed the Panthers and the team colors are purple and gold. Prairie View A&M is a charter member of the Southwestern Athletic Conference (SWAC), and is a member of the West Division. Prairie View competes in NCAA Division I in all varsity sports; in football, the Panthers play in the Division I FCS. Prairie View's most notable rivals are Texas Southern University and Grambling State University. In summer 2016, Prairie View A&M completed the first phase of construction on its $60 million football stadium and athletic field house. The state-of-the-art facility is 55,000 square feet and holds up to 15,000 people. The final phase of construction will increase capacity to 30,000 people. All home basketball games are held in the William Nicks Building which was built in the early 1960s. The building has gone through several renovations since its inception and holds approximately 6,500 people. Prior to a double header against the Texas Southern Tigers, a ribbon cutting ceremony was held for the renovated baseball stadium on April 26, 2014. Along with the opening, the stadium was formally dedicated to former Panthers baseball coach, John W. Tankersley. The renovated stadium features seating for 512 including 192 chair backed seats, new concession stand, new restrooms, press box, and bricked dugouts. The stadium is also Wi-Fi enabled. The Panthers dedicated the stadium sweeping the double header winning 9-0 and 7-4. Prairie View A&M's marching band is officially known as the Marching Storm and has close to 300 active members. Some of the band accomplishments include performing at the Super Bowl, the Macy's Thanksgiving Day Parade, a U.S. presidential inauguration, the Tournament of Roses Parade, the Honda Battle of the Bands, the Houston Rodeo, the grand opening of the NRG Stadium, and at a 2004 Dallas Cowboys game with Destiny's Child. Also the band made an appearance on MTV in 2011. From 1984 to 2009 the marching band was directed by George Edwards. The Black Foxes is the 15–20 size majorette danceline that accompanies the band. The Twirling Thunder is the 20 - 25 size color guard that performs with the band. Dave Webster 1959 Former American Football League All-Pro football player for the Dallas Texans/Kansas City Chiefs, Prairie View A&M University Hall of Fame inductee and one of the first blacks to play professional football in the American Football League. ^ Platoff, Emma (November 3, 2017). "How Prairie View A&M lured a former Ivy League president out of retirement". TexasTribune.org. Retrieved November 5, 2017. ^ a b c "Total Student Enrollment By Ethnicity Fall 2010 – Fall 2014" (PDF). pvamu.edu. Prairie View A&M University. Archived from the original (PDF) on September 12, 2015. Retrieved July 27, 2015. ^ a b PVAMU Visual Identity Guidelines (PDF). Archived from the original (PDF) on February 8, 2017. Retrieved April 9, 2016. ^ RUBLE, WOOLFOLK, GEORGE (June 15, 2010). 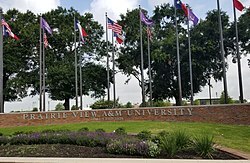 "PRAIRIE VIEW A&M UNIVERSITY". TSHAOnline.org. Retrieved November 5, 2017. ^ "Application : Undergraduate Medical Academy". Pvamu.edu. Retrieved 2016-04-09. ^ USA (2015-09-28). "Addressing medical school diversity through an undergraduate partnership at Texas A&M Health Science Center: a blueprint for success". Acad Med. 83: 512–5. doi:10.1097/ACM.0b013e31816be5cf. PMID 18448910. ^ "The Honors Program". Pvamu.edu. Retrieved 2016-04-09. ^ Bhatia, Anchal (22 December 2014). "PVAMU is the Top Producer of Black Architecture Undergrads". IBCU Lifestyle. ^ "Top 100 Degree Producers: Baccalaureate". Diverse. Archived from the original on May 5, 2016. Retrieved April 23, 2016. ^ "Accreditations : PVAMU Home". Pvamu.edu. Retrieved 2016-04-09. ^ "Prairie View A&M hosts USA Track and Field For Final Training Before The Olympics". Onnidan's HBCUSports. Retrieved November 5, 2017. 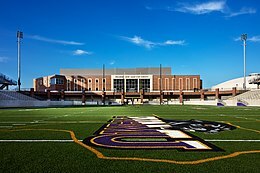 ^ "New football stadium ushers in next era at Prairie View A&M". Chron.com. Retrieved November 5, 2017. ^ "Total Student Enrollment by Gender Fall 2010 – Fall 2014" (PDF). pvamu.edu. Prairie View A&M University. Archived from the original (PDF) on August 13, 2016. Retrieved July 27, 2015. ^ "Total Student Enrollment by Geographical Source Fall 2010 – Fall 2014" (PDF). pvamu.edu. Prairie View A&M University. Archived from the original (PDF) on August 13, 2016. Retrieved July 27, 2015. ^ "Company News". Austin American-Statesman. June 27, 1998. Retrieved October 5, 2011. American Campus Communities has been awarded projects totaling $52.5 million to develop, build and manage three student housing projects at Prairie View A&M University, Texas A&M University and Iona College. ^ Home page. University College. Retrieved on October 5, 2011. ^ Home page. University Village. Retrieved on October 5, 2011. ^ "Ribbon-Cutting Ceremony Held for New 466-Bed Housing Facility : PVAMU News". www.PVAMU.edu. Archived from the original on November 14, 2017. Retrieved November 5, 2017. ^ a b "PVAMU Fact Book 1996–2001 Archived September 24, 2015, at the Wayback Machine." Prairie View A&M University. 77. Retrieved on October 5, 2011. ^ "Organizations : Student Affairs". www.PVAMU.edu. Retrieved November 5, 2017. ^ "Student Government Association". www.PVAMU.edu. Retrieved November 5, 2017. ^ "New Look". Panther Stadium. Retrieved 2016-04-09. ^ "Tankersley Field Ribbon Cutting, SWAC Baseball Showdown set for Saturday at 12:30 P.M." Prairie View A&M University Athletics. April 23, 2014. Archived from the original on January 13, 2015. Retrieved January 12, 2015. ^ "Panthers Dedicate Tankersley Field in Style with Doubleheader Sweep over TSU". Prairie View A&M University Athletics. April 26, 2014. Archived from the original on January 13, 2015. Retrieved January 12, 2015. ^ "About Us : Marching Storm Band". www.PVAMU.edu. Retrieved November 5, 2017. ^ Fiyah. "PVAMU's Marching Storm Director "George Edwards" Passes". We.archive.org. Archived from the original on 1 June 2009. Retrieved 6 November 2018. ^ "Congratulations to the 2016-17 Black Foxes Dance Line! : Marching Storm Band". www.PVAMU.edu. Retrieved November 5, 2017. ^ "Twirling Thunder : Marching Storm Band". www.PVAMU.edu. Retrieved November 5, 2017. ^ "Sebastian Barrie". pro-football-reference.com. Retrieved February 23, 2013. ^ Ankeny, Jason. "Clora Bryant". AllMusic. Retrieved 28 November 2017. ^ "Dr. J. Don Boney". Past Presidents, University of Houston–Downtown (2000), www.uhd.edu. Archived from the original on 2007-09-27. ^ Finder, Chuck (February 24, 2002). "Trail blazer: Willie 'The Pro' Thrower opened door for black quarterbacks". Pittsburgh Post-Gazette. Retrieved February 23, 2013. ^ Cline, Georgette (July 12, 2012). "Kirko Bangz Sheds Light on Marriage, Houston Rap Veterans, Ditching College". The Boombox. Retrieved February 23, 2013. ^ "Brown, Tony Russell (Charles)". Handbook of Texas Online. Retrieved February 23, 2013. ^ "CLEAVER, Emanuel, II, (1944 - )". Biographical Directory of the United States Congress. Retrieved February 23, 2013. ^ PVPantherAthletics YouTube channel (October 19, 2011). "Prairie View A&M Baseball Receives Visit From Cecil Cooper". YouTube. ^ Who's who in Colored America (Yenser 1942): 153, 156. ^ Birchmeier, Jason. "Dorrough Biography". allmusic.com. Retrieved February 23, 2013. ^ "Terry Ellis". HBCU Connect. Retrieved February 23, 2013. ^ "Louise Daniel Hutchinson Interviews". Record Unit 9558. Smithsonian Institution Archives. Retrieved 20 April 2012. ^ "Lenwood Johnson". The Banner-Press. 2018-05-18. Retrieved 2019-01-04. ^ Ambrose, Patrick (September 2009). "DJ Premier: Hope to the Underground". The Morning News. Retrieved February 12, 2012. ^ "Doris Eastman Harris, "Smothers ... New Voice of a Silent Majority", October 2, 1970". The Malakoff News. Retrieved October 11, 2013. ^ "Legislative Reference Library – James H. Stewart". ^ "Mr. T biography". Biography.com. A&E Networks. Retrieved February 23, 2013. ^ "Valien, Bonita (1912-2011)". Armistead Research Center. Tulane University. Retrieved July 24, 2018. ^ "Valien, Preston (1914-1995)". Armistead Research Center. Tulane University. Retrieved July 24, 2018. ^ "Waller, Lt. General Calvin (1937–1996)". Blackpast.org. Retrieved February 23, 2013. ^ "WASHINGTON, Craig Anthony, (1941-)". Biographical Directory of the United States Congress. Retrieved February 23, 2013. ^ Timms, Ed; Emily, Jennifer; Jeffers, Gromer Jr. (July 16, 2011). "After acclaim for exoneree work, Dallas DA Craig Watkins taking hits". The Dallas Morning News. Retrieved February 22, 2013. ^ Wade-Lewis, Margaret (2005). "Mark Hanna Watkins". Histories of Anthropology Annual. 1: 181–218. doi:10.1353/haa.0.0001. ^ "Representative James White's Biography". votesmart.org. Retrieved 3 October 2013.